We’re thrilled to announce that we’ve added a new open textbook to our collection. 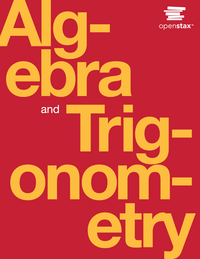 Description: Published by OpenStax College, Algebra and Trigonometry provides a comprehensive and multi-layered exploration of algebraic principles. The text is suitable for a typical introductory Algebra & Trigonometry course, and was developed to be used flexibly. The modular approach and the richness of content ensures that the book meets the needs of a variety of programs. Algebra and Trigonometry guides and supports students with differing levels of preparation and experience with mathematics. Ideas are presented as clearly as possible, and progress to more complex understandings with considerable reinforcement along the way. A wealth of examples – usually several dozen per chapter – offer detailed, conceptual explanations, in order to build in students a strong, cumulative foundation in the material before asking them to apply what they’ve learned. Algebra and Trigonometry cover by OpenStax College is licensed under a Creative Commons License 4.0 International.